Sulphur clover is a large, shortly rhizomatous, native perennial. In strong sunlight the flower heads can look a little sulphurous but the name is a little misleading and the colour of the flowers is closer to creamy-yellow. Flowers throughout June and July. 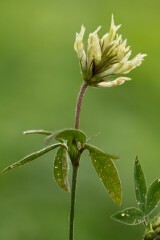 Sulphur clover is a plant of chalky boulder-clays and occasionally chalk. It was once a characteristic plant of meadows and unimproved pastures in East Anglia but as much of this has been ‘improved' or converted to arable it is now rare and more likely to be found on road verges and railway banks. It is often mentioned in the literature as being particularly attractive to foraging bees and butterflies and when we have grown it as a crop it is certainly visited by a large number of bumble bees particularly Bombus lapidaries and Bombus hypnorum. Can be sown at any time of the year although may be a little slow to germinate.